The chapel part of our property was built in 1867. The skilled craftsmanship in traditional knapped flint and Norfolk red brick is a visual delight. Extended first in the 1970s including a sound reinforcement and hearing loop system, more recently an excellent modern catering kitchen has been installed. We enjoy our strong links with the Parish Church, often sharing services and exchanging pulpits – our noticeboard announces all our special events. 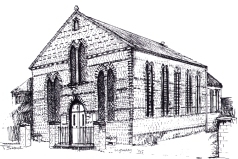 Our church is also an integral part of community life in our village, including the computer training group; village cinema; and village car scheme. Do come and join us for worship, for coffee or any of our events. Many other organisations regularly use our premises. We are the waste paper collection point for village.